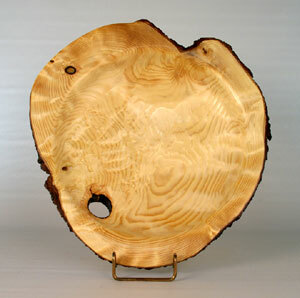 This piece of spruce burl was made into a shallow dish that is 12″ by 2″. The creation, when I was finished looked to me just like an artist’s palette , hence the name. The Chatoyance (changing colour of the grain) has to be seen in person. It is a really amazing piece of wood. It is on a stand so you can see it, however is has a flat bottom so it will sit on a table.